The Ireito at Woodlawn Cemetery. SANTA MONICA — The 58th annual Memorial Day service at Woodlawn Cemetery, hosted by the West Los Angeles Japanese American Community Center, Venice Japanese Community Center and Santa Monica Nikkeijin Kai, will be held on Monday, May 29. This Memorial Day marks 58 years since Japanese American communities in Los Angeles’ West Side started to gather at the Ireito (memorial tower) to honor the area’s Issei pioneers and Nisei soldiers who died in World War II and the Korean War. They endured hardship and sacrifice in hopes of opportunities now enjoyed by current and future generations. The combined Buddhist and Christian service, which is open to the public, begins at 9 a.m. Woodlawn Cemetery is located on the corner of 14th Street and Pico Boulevard in Santa Monica. In 1952, a group of Issei and Nisei within the Bay Cities area realized that persons of Japanese ancestry did not have a common site where they could gather and honor the deceased members of their communities on Memorial Day. A prospectus for building a monument for the unknown pioneers and predecessors of the Bay Cities area was adopted. It took seven years to realize their dream of being able to honor those who made possible Japanese Americans’ acceptance into mainstream America. On Nov. 22, 1959, on a cemetery site donated by the City of Santa Monica, the Ireito was dedicated. Among those taking part in the ceremony were Col. Carl F. White, U.S. Army; Japanese Consul General Yukio Hasumi; and Santa Monica Mayor Ben Barnard. On Jan. 17, 1994, a temblor with a magnitude of 6.9 toppled and destroyed the monument. 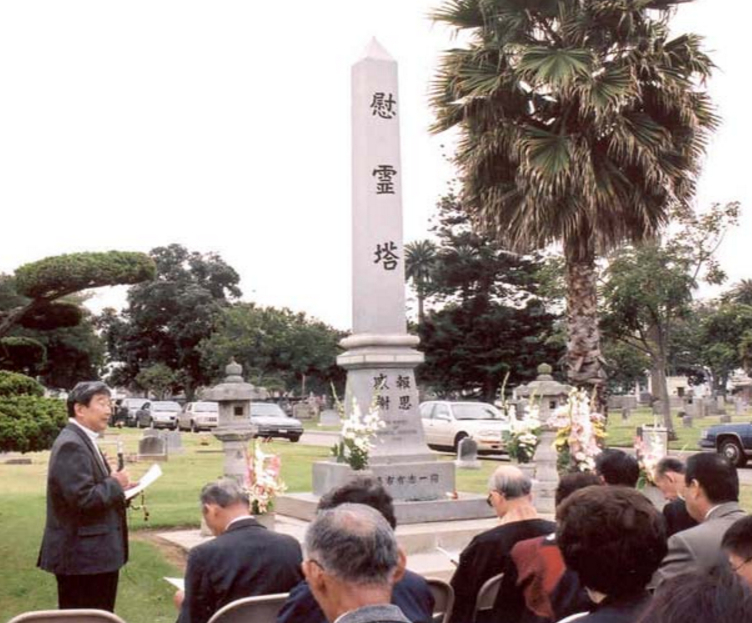 A new one was constructed and rededicated at the 35th Bay Cities Japanese Community Memorial Day Joint Service on May 30, 1994.